"My favorite chip is the green Gold Rush $25. What a beauty!!" We had never met James or spoken with him before reading his Official poker chip price guide. We reached out to James to express thanks for publishing The Official U.S. Casino Chip Price Guide, Fourth Edition . As we have noted around the website, we relied heavily on this book to gain our inspiration for our chip designs. Once we had the opportunity to speak with James, we asked him to take a look at our designs and to give us his honest opinion. He was a little hesitant at first, given he was worried that we were just copying old casino styles. When we explained to him that we only use the old authentic chips as a guide to design our own chips then he was more than happy to take a look. When he gave us his feedback we knew we were on to something big! "Your chips are awesome! I wish the casinos today were designing chips this cool. Many of today's casinos just play it safe, but I see in your designs you know how to connect with the spirit of Vegas. 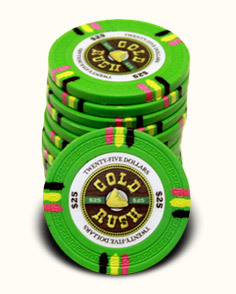 My favorite chip is the green Gold Rush $25. What a beauty." I am James Campiglia and I have avidly been collecting casino memorabilia for over 25 years. I was born in Las Vegas, Nevada where I became very interested in Nevada casino history and started to collect postcards and pictures of the older casinos. I then wanted something more of substance, something used in these old casinos and there began my quest for casino dice. A good friend was starting to collect chips and we would run all over Vegas, and sometimes Nevada, to build our collections. It's the treasure hunt that's in my blood! A few years after collecting we struck a deal and traded collections. I then really got into chips and sought them at antique shops, yard sales, the swap meet, etc. and later ran ads in the paper to buy chips. At one time I thought I had most of Vegas helping me and that I was the only one that wanted these obsolete, no longer of any value, chips. Soon that would change. The Casino Chip & Gaming Token Collectors club started about 1990 and I soon joined. 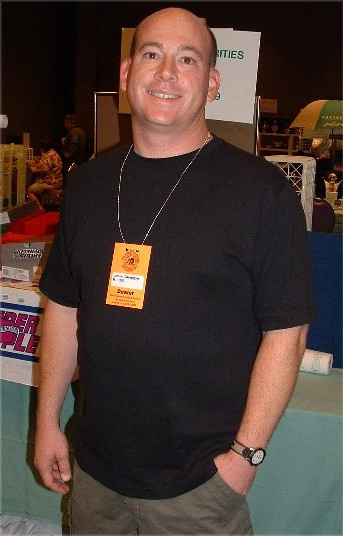 We had a convention in 1991 and I displayed there. I later met another collector who had a background in writing and we came to the same conclusion, the hobby needs a better book. A book with full color pictures! By 1998 we had our first Official U.S. Casino Chip Price Guide out and the hobby has not been the same since. This book took our little hobby to new levels once people viewed the colorful chips and learned more history along with seeing some of my harder to find postcard images which are throughout our books. We have done 4 books now, with 400 pages, and cover legal gambling destinations throughout the U.S.A. I now actively sell at our yearly chip and gaming conventions in Vegas as well as sell on eBay the many duplicates I have amassed over the years. And every now and then I find a collection and have more treasures to keep, and some to sell. I still collect the postcards, have some dice, as well as ashtrays, matchbooks, and all kinds of older casino marked items- even old rectangular packs of sugar with hotel logos. One of my most exciting casino adventures, besides traveling all over to find chips hidden in small towns, was when I was buying the dug up chips from the Dunes Hotel & Casino site. Chips were coming out of the ground that no one had seen for many years! The Dunes as a way of destroying their obsolete chips buried chips in the concrete foundation for the South Tower hotel. Lucky construction workers took home some of these excavated chips which were found after the implosion- I found them and made offers to by hand fulls of chips for prices they could not turn down.